Get high quality restaurant recommendations by chatting with Pepper! GINKAN Inc. (Location: Minato-ku, Tokyo, Founder & CEO: Tomochika Kamiya, “GINKAN”), managing company of SynchroLife, the artificial intelligence based social restaurant discovery service, has announced the release of a robo app for “Pepper for Home”, the home model of SoftBank Robotics Corporation’s humanoid robot “Pepper”, titled “SynchroLife for Pepper”. Using SynchroLife’s restaurant recommendation artificial intelligence in the robo app, Pepper can verbally recommend restaurants to users. Pepper transforms into a restaurant concierge using the SynchroLife restaurant recommendation artificial intelligence robo app! Using the SynchroLife robo app, Pepper’s home model “Pepper for Home” can use the same restaurant recommendation artificial intelligence engine as the SynchroLife mobile app, and chooses the best restaurants to recommend based on over 190,000 reviews and each restaurant’s popularity in the SynchroLife social media service as well as repeat factor and other key indicators. Using this recommendation engine, Pepper can verbally recommend quality restaurants and turn into each user’s personal restaurant concierge. Pepper can personalize restaurant recommendations even further when users link their smartphone SynchroLife app account with the SynchroLife for Pepper robo app. SynchroLife’s restaurant recommendation algorithm doesn’t use average scores, advertisements, or paid placements, and instead it analyzes the reviews on the SynchroLife platform along with user actions and view history to pick the best restaurants and personalize the restaurant recommendations it gives to each user. 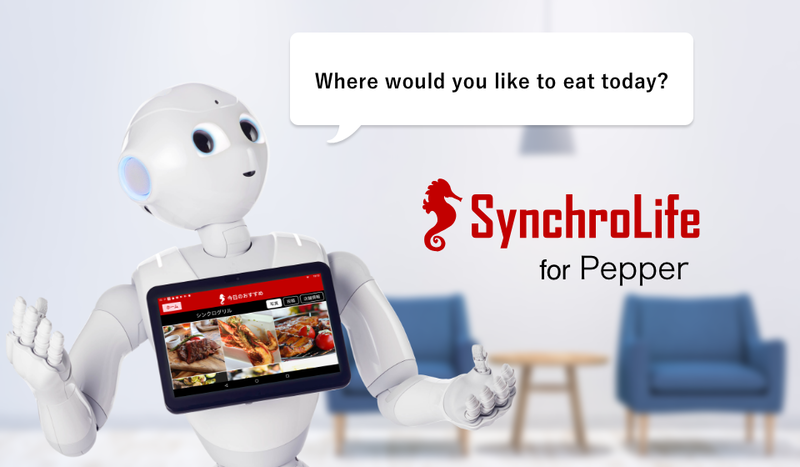 “SynchroLife for Pepper” was created to explore the new potential of robots acting as personal restaurant concierges by making the SynchroLife algorithm available to the humanoid robot Pepper through the robo app. Pepper will introduce one recommended restaurant daily. Pepper introduces restaurants that are popular on the SynchroLife social media platform, and also provides personalized recommendations based on each user’s usage history. “SynchroLife for Pepper” can be linked with the smartphone app “SynchroLife” (available for iOS and Android) allowing recommendations to be further personalized by the bookmarks and other user action data from each user’s smartphone app account. SynchroLife is a social restaurant discovery service that helps diners find good restaurants fast and reliably. SynchroLife’s social media-style app interface encourages reviews of the best restaurants and experiences, creating a database of quality recommendations. SynchroLife then guides each individual user to the best restaurants as quickly as possible by learning their dining preferences and analyzing them with the preferences of other users. The service is currently available for both iOS and Android smartphones in over 155 countries and four languages (Japanese, English, Korean, and Chinese). SynchroLife is the world’s first restaurant discovery service to include a token economy and solves both restaurant search problems for diners and marketing problems for restaurants by rewarding core users with token rewards for reviews and diners with cashback rewards for their meals. Moving forward SynchroLife plans to use its artificial intelligence restaurant recommendation engine in robots, travel services, and other services and devices beyond just smartphones. SynchroLife’s goal is to help improve people’s lifestyles by reliably guiding them to the best possible dining experience every time they eat out. Follow SynchroLife on Medium for the latest news! SynchroLife is the world's first social restaurant review platform with token rewards, connecting users and restaurants to build a new token-based economy.